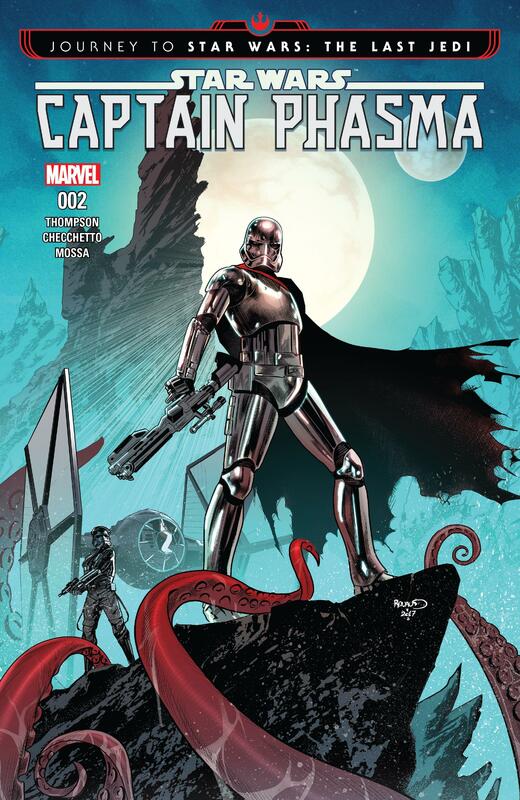 Plot: In Captain Phasma #2, the First Order stormtrooper commander is in pursuit of the one man that holds evidence concerning the fact that Captain Phasma lowered Starkiller Base’s defense shields. In the previous issue we learned what happened with Phasma during her escape from Starkiller Killer base, which was depicted in Star Wars Episode VII. Here, she’s fled the destruction in a TIE fighter and hunts Lieutenant Sol Rivas to a distant planet with unforgiving living conditions. This is a callback to her origins as explained in the Phasma novel, as she notes that it is like somewhere she’s lived before. That somewhere is Parnassos. On the planet, named Luprora, Phasma and her pilot, TN-3465 discover that their man has run away on foot, and though the conditions, with giant sea beasts and all, would suggest that he wouldn’t survive, Phasma won’t take the assumption as a knot on this loose end. In disguise, as simple travelers as opposed to members of the first order, to keep from drawing attention, Phasma and TN-3465 prepare to venture into a wasteland of terrifying beasts and likely other unknown dangers, to confirm that the Lieutenant deceased. Story: This issue serves to be a set up for the rest of the arc. Not much happens but the props have been put into place. A Parnassos-like planet serves as a stage and reference to Phasma’s rough past. The changing of garments furthers that idea as what she’s wearing could have been something similar to what she wore there while traveling to the First Order’s fallen ship. In either case, I love how the paneling is clever enough not to reveal her face. Each page in which she was changing, specifically those when she removed her helmet, were edge of the seat moments, but alas, she replaced her shiny First Order helmet with something far more rugged, and yet somehow still fitting. I really enjoy how this book really taps on key points of Phasma’s personality. She’s professional in what she does, even if selfish or downright maleficent. She refuses to allow the escaped, likely dead Rivas, to escape her without confirmation of his death. Even as the locals ensure her that he’s dead, in her mind he isn’t until she sees it. This attitude is why Phasma has never faltered in her quest for survival. It’s why when the rest of the galaxy and its resistances, orders, rebellions or otherwise, all cease to exist, she will remain. Art: The art in Captain Phasma #2 is something you really sit and bask in. It’s the kind of comic that you don’t want to rush, just to savior the beauty of it. The cover gives Phasma a warrior’s stance and does well to bring out the killer in her. I feel like it references another picture but I can’t think of it off the top of my head. In any case it fits. On the pages, everything is gorgeous to look at. The ships, the people the terrain, all of it is spot on. I was somewhat dismayed when they changed out of their armor because the colorist just does such a darned good job at making hers shine so well. The entire team is top notch and I really enjoy it. Verdict: Captain Phasma #2 was stage setting and beautiful, but it’s clear we haven’t gotten to the meat of the arc just yet. While the first issue did the excellent job of introducing the goals of our characters, this one didn’t have quite as much flare. 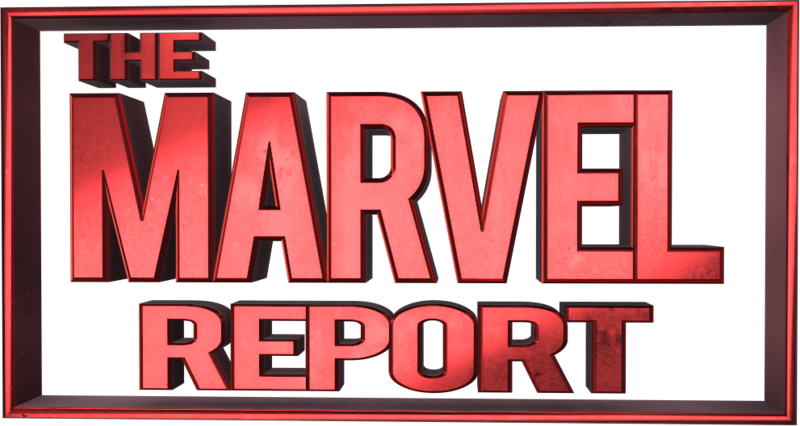 That by no means lessens the writing, however, and it makes me excited for the next issue.